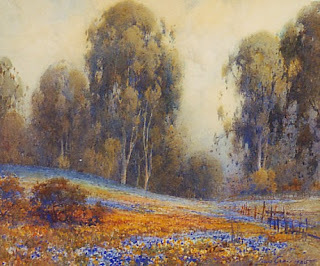 Other artists active in the late 19th century represented in the exhibition included Jules Tavernier (1844 – 1889), noted for his quiet scenes featuring California’s unique Redwood trees, and Chris Jorgensen (1860 – 1935). 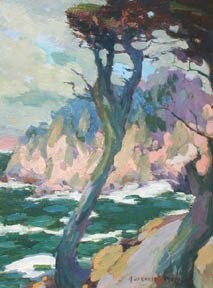 Jorgensen, often remembered for his highly detailed coastal scenes featuring the Monterey area’s famous Cypress Trees, built a boulder home in Carmel in 1905 which later became the La Playa Hotel. The city of Carmel-by-the-Sea was founded in 1902, and incorporated in 1916. In 1905, the Carmel Arts and Crafts Club was formed to support the local artistic community. In 1906, following the San Francisco earthquake, a large number of talented artists moved to the Carmel area. 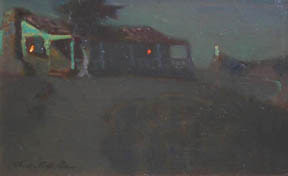 The Carmel Arts and Crafts Club held frequent exhibitions of works by local artists and, in 1913, began providing lessons for aspiring painters. Distinguished artists William Merritt Chase, Xavier Martinez, and Mary DeNeale Morgan all taught six week classes arranged by the Club for $15 in those early days. In 1907, artists William Keith, Xavier Martinez, Karl Neuhaus, and Will Sparks founded the Del Monte Art Gallery, now the Herrmann Hall at the Naval Postgraduate School in Monterey. 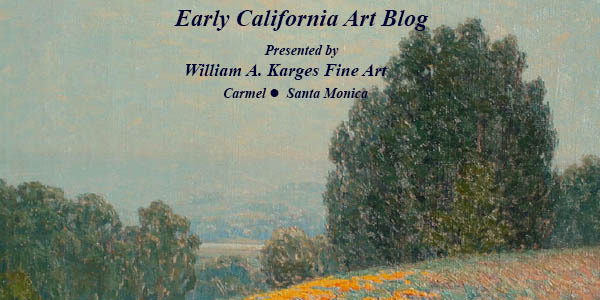 This was one of the very first galleries focused specifically on work by California artists. In 1927, The Carmel Art Association was formed, founded by artists Josephine Culbertson and Ida Johnson. Early members of the group included Paul Dougherty and E. Charlton Fortune. Their mission statement explains that “the Association exists to provide its members with a permanent art gallery, to advance knowledge of, and interest in the arts, and to create a spirit of cooperation and fellowship among artists and the community”. The association is the second oldest operating non-profit artist cooperative in the United States, after a group in Rockport, Massachusetts, and to this day, member artists are always selected by their peers. Fine examples of the rich artistic history of the Carmel/Monterey area can be found in museums throughout California and the United States. Important paintings by artists including a large selection of works by Impressionist E. Charlton Fortune are currently on view at the Monterey Museum of Art in the exhibition “Land and Sea: Paintings and Photographs of Monterey and Beyond”. The exhibition continues through October 24, 2010.